Ove is a grumpy old man. Possibly one of the grumpiest, curmudgeonly-ist old men you’ve ever had the displeasure of encountering (and there’s something familiar about him; surely we’ve all made the acquaintance at some time or other of that cranky old person who yells at people to “GET OFF MY LAWN!”). He makes his daily circuit of the housing complex in which he’s lived for forty years, like a detective, checking for evidence of bent and broken rules, and making note of them. He yells at people and has nary a nice word to say; he’s full of piss and vinegar, anger and curse words. He’s a very unlikable fellow. And, seriously, all he wants is to die. And then you begin to see what makes Ove tick through a series of flashbacks. And you begin to see that that old saying, “Everybody has a story” is really true. And our stories shape us. And what you see on the outside is not the whole story. Ove has suffered great hardship and loss in his life – the most recent being his beloved wife, the only person on the planet who understood him and loved him anyway. Shortly after losing his wife, he is let go from his job that he’s held for thirty years. And now he feels he has nothing left to hang around for, and so plans his suicide so that he can just be reunited with Sonja. And then a new family comes crashing into Ove’s little world – literally. Ove’s numerous and carefully planned suicide attempts are foiled time and time again, and slowly this family, with its incompetent husband, “foreign” pregnant wife, sullen seven-year old, and boisterous three-year old get under Ove’s skin – as do a half-mangled alley cat, an obese neighbor, a teenager eager to impress a girl he likes, and host of other colorful characters. All of these people (including the cat) manage to see something in Ove that hides behind his gruff, rude exterior, and soon Ove realizes that he may as well stick around to help all of these incompetents. Set in and originally published in Sweden, this is nonetheless a universal story – one that will resonate with everyone. 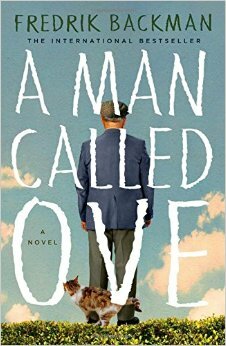 It’s a charming, humorous, and ultimately tender story about the frailties and superpowers of the human heart.